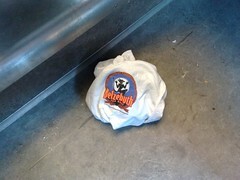 I’ve been trying it several times: taking pictures of shirts in the train. But it’s so annoying that other people can hear you doing it. My cellphone makes that noise when taking a photograph. There is a way to turn it off, a friend of mine found out. The only problem now is that I don’t have any shirts left to take with me in the train.